On Thursday August 25, 2011 I was a member of a panel representing the NYS Government Finance Officers Association (NYSGFOA) in an attempt to clarify the impact of the 2% Tax Cap. I joined with leaders from Associations representing Counties, Towns, Villages, Cities, School Boards and Fire Districts to discuss its implementation and understand the details. The Office of the State Comptroller shared some preliminary guidance for local governments with regard to implementing the real property tax levy cap. Although not all questions and issues have been resolved, the NYS Division of the Budget will be providing more formal guidance soon. Official Guidance: Official guidance will be issued by the NYS Division of the Budget. This guidance (expected to be 14-16 pages) is expected shortly (perhaps as soon as today). Consumer Price Index: The CPI Index to be utilized in calculating the real property tax levy cap for local governments (outside of school districts) will be the National CPI-U Unadjusted (Consumer Price Index All Urban Consumers--Unadjusted). CPI-U for calendar year local governments has been calculated at 2.01%, therefore the tax levy cap is 2% for the coming fiscal year. The CPI index to be utilized for school districts (and local governments with non-calendar fiscal years) has not yet been determined. Special Districts: The budgets of special districts with their own governing boards will be subject to their own real property tax levy cap. However, special districts which have as their governing board the governing board of the municipality will NOT be subject to their own cap. The budgets of those special districts will rollup to the municipality's budget. Special districts which are supported by fees and not ad valorum levies or special assessments are exempt from the cap. Tax Certioraris: Tax certioraris and breach of contract issues are NOT excludable from the tax levy cap. PILOTS: Properties coming off PILOT (Payment in Lieu of Taxes) agreements will NOT be considered part of the Quantity Growth Factor number in calculating the real property tax levy. Only real brick and mortar changes impacting a local govenrment's taxable assessed value will be included. Therefore, a reassessment would provide no benefit with regard to the real property tax levy cap. Retirement Contribution Exemptions: The property tax levy cap legislation exempts the portion of pension rate increase that exceeds 2 percent of the "system average actuarial contribution rate" over the prior year. For Fiscal Year 2012-13, the average contribution rate for the Employee Retirement System (ERS) will increase from 16.3 percent of salaries to 18.9 percent, a change of 2.6 percentage points. The average contribution rate for the Police and Fire Retirement System (PFRS) will increase from 21.6 percent to 25.8 percent, a change of 4.2 percentage points. Only .6% of salaries under ERS (on average) and 2.2% of salaries for PFRS (on average) will be exempt from the real property tax levy cap calculation. THE EXEMPTION IS NOT BASED ON THE LOCAL GOVERNMENT'S PENSION CONTRIBUTION BILL. OSC is working on providing the projected salary bases and the amount of the pension exclusion in early September. The pension exclusions will not apply to those employers which are already amortizing their pension payments. Overrides: OSC does not anticipate providing a template for local governments to utilize when developing a local law authorizing them to override the levy cap. 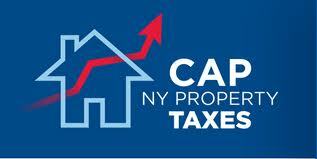 It can be presumed that any local law adopted to permit an override of the real property tax levy cap (even if done so just before--even the same day as-- the budget vote) will be accepted by the NYS Department of State. Required public hearings must still be held and 60% of the voting power of the entire governing board must approve the override (school budgets require a 60% vote of those voting on the budget to approve any override). Overrides are only applicable to the upcoming budget. Default Budgets: If a budget is not approved by the governing board, the preliminary budget becomes the official budget (not applicable to school districts as they have contingency budget provisions set in law). However, the increase in the real property tax levy can NOT exceed the levy cap (unless an override is approved as noted above). Reporting Form: The real property tax levy cap Reporting Form, provided by OSC, to assist local governments in determining their real property tax levy should be available next week. OSC will provide local governments their link and PIN to access the form. The form will be in a similar reporting environment to the AUD. The NYS Department of Taxation and Finance is still working on calculating the quantity growth factor numbers. NOTE: Tax levy reporting will be due to OSC prior to budget adoption by local governments and by March 1st for school districts. School districts will also need to send the budget to the NYS Department of Education and the NYS Department of Taxation and Finance. OSC will neither certify the tax levy figure nor correct inaccurate data. NOTE: If an incorrect tax levy for 2012 is not discovered in an OSC audit (until for example 2015), the amount of funds required to place in reserve will be based on the prior 3 years of inaccurate levies. This assumes that a tax levy override was not enacted. Relevies: The relevy of unpaid property taxes and other assessments and whether or not they apply toward the real property tax levy cap is still being reviewed. •	OSC will be creating guidance on how reserves will be held. •	OSC will be providing assistance to local governments that consolidate to establish a new real property tax levy cap. •	OSC will be creating a tax levy cap page on their web site in the near future with much more information, illustrations, and links to resources.